Skin cancers are various types of malignant tumors formed from different types of cells in the skin tissue. Primarily, skin cancers are divided into three types: basal cell carcinoma (the most common), followed by squamous cell carcinoma, and melanoma (the most aggressive, dangerous, and deadly). Skin cancers can present as a lumps, bumps, or growths on the skin, which increase in size or change over time. Because they can appear anywhere on the body and are often completely painless, they may go unnoticed for months. Some develop ulcers, while others manifest as red, scaly areas that do not respond to usual treatments. Other forms appear as a darkly colored area (like a mole or a freckle) which arises suddenly and is changing rapidly. Since skin cancer can develop anywhere, they are often discovered by a routine visit to the doctor, particularly if they are in out of the way places, like your scalp, back, or feet. As the most common type of skin cancer, basal cell carcinoma often appears as a result of years of sun exposure or tanning (indoors or out). It has the appearance of a pink patch of skin or a bump that is flesh tone. Because it can spread to surrounding bones and tissues, early diagnosis and treatment is imperative. Only slightly less common than basal cell carcinoma, squamous cell carcinoma, also a result of sun exposure, often develops on the face, ears, neck, chest, or back. Often appearing as a red, scaly patch, a recurring sore, or a red bump, squamous cell carcinoma can spread deep into the skin’s layers causing greater damage to your body. Early detection and treatment can prevent the spread. 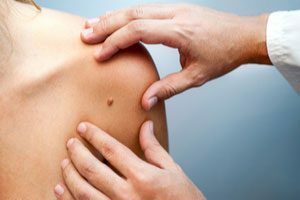 Melanoma often manifests as a dark mole or mark on the skin which wasn’t there previously. Because melanoma is the life-threatening form of skin cancer, urgent treatment is needed. Skin cancers can affect anyone and may be deadly. As a resident of South Florida your risk for skin cancer is increased due to the continued exposure to the suns powerful rays. The best protection again these cancers is early detection. Use a broad-spectrum sunscreen with SPF 30 or above on your entire body, whenever you are in the sun. Reapply sunscreen often, even more often if you’re in the water or sweating. Ask your hair stylist or barber to check your scalp during your next appointment. Always wear a wide brimmed hat when outside. Visit your health care provider for professional skin cancer screenings. If you find yourself diagnosed with skin cancer, always follow your physician’s advice regarding treatment. Most skin cancer can be resolved with early detection and excision of the site with an adequate margin. If the size or location of the cancer dictates, more complicated surgical procedures may be required. Other types of skin cancer are treated with cryotherapy, electrosurgery, curettage, radiation therapy, and photodynamic therapy, all of which have proven successful in the treatment of skin cancer.